Written on May 1, 2008 by Kevin. As a kid, my family used to go to theme parks occasionally. One of our frequent stops was Knotts Berry Farm. The entire family loved the Soap Box Derby ride and the Water Rapid ride was always a big hit during the summer heat. My wife also used to go to the park so we both had expectations going in. We headed over to the park after getting situated at our hotel and took advantage of their half off admission prices after 4pm deal. We headed in and were instantly set back. California was experiencing a heat wave which was just our luck. Kids were playing in the fountains like it was common practice. I don't recall seeing one security guard during our entire visit. 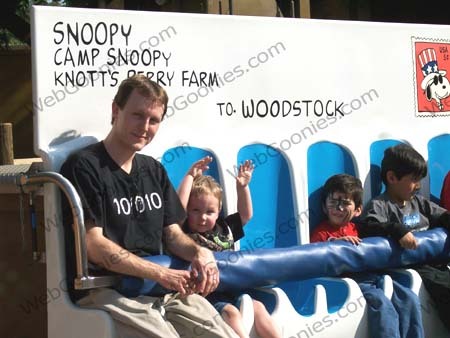 We headed over to Camp Snoopy to give Rylan a chance to have some new fun on the rides. He went on his first big kid rides as pictured below. The first ride was a free falling type ride that was more jerky than anything else. Rylan was pretty excited about it and when his mom asked him how the ride was afterwards he agreed that it was a bit scary. 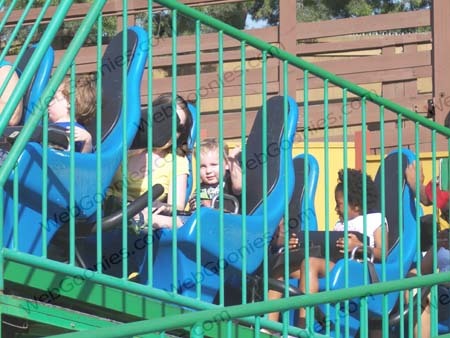 My wife took him on the next ride which she said was also more jerky than anything but the pictures I have of Rylan and his big smiles says he didn't care. We walked around the park looking for our old time favorites and amazingly they were no where to be found. They turned this place into an older kid amusement park. It was filled with carnival style games which confused me why a big company would stoop to such shady games that you pay to lose at. The best part of the visit was that we got the kids caricature picture done. I will put up a video next week of the entire process. It turned out pretty well. We cut the theme park trip very short as there was very little to do. We went there looking for specific attractions that they had simply gotten rid of. It was definitely a bummer. I think we will stick to the outside of the park next time where they sell some tasty fried chicken and of course their biscuits and jelly are quite good as well.